New York artist Devorah Sperber exhibits five of her multi-colored thread-spool installations and two recent works composed of thousands of colored crystals. Included in this exhibition are full-scale recreations of Leonardo da Vinci’s The Last Supper and the Mona Lisa, as well as Picasso’s portrait Gertrude Stein and van Eyck’s Man in a Red Turban. 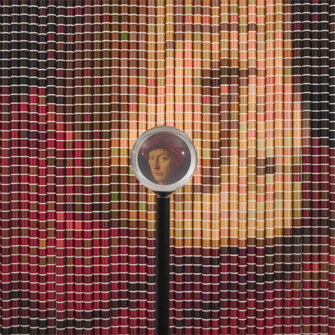 Using spools of thread, Sperber creates a pixilated, three-dimensional, inverted image of a masterpiece, which appears as a colorful abstract to the naked eye. Once viewed with an optical device, however, the work becomes immediately recognizable as the famous painting. Sperber deconstructs familiar images so that the brain can reconstruct them. Her framed crystal reproductions similarly address the way we think we see versus the way the brain processes visual information. The following recording is of an unscripted conversation between artist Devorah Sperber and former Brooklyn Museum Curator of Prints and Drawings, Marilyn Kushner.